Perhaps you are wondering what I ate after 21 days of austerity? Both common sense and the guidebook tell you to ease back in, adding one category of food back every few days to find out what you might be sensitive to that you didn’t notice before. Having gone through this process before, I have a fairly good idea of the foods that bother me (I’m talking to you, gluten! ), so it seemed logical to me that I would wake up on day 22 and make my way down to Chinatown for Dim Sum. I went with my oldest daughter to meet some of her school friends, one of whom was marching in the parade. 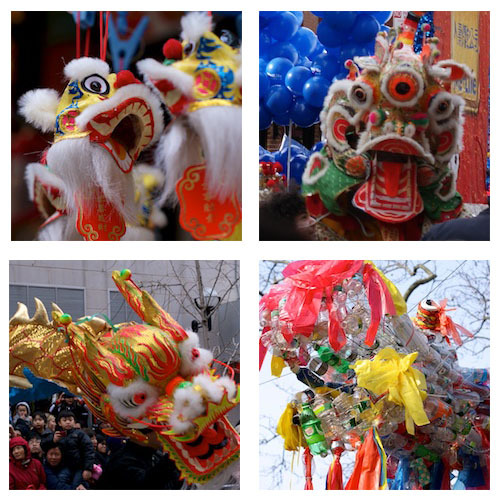 New York City puts on a Lunar New Year parade like no other and this year being the Year of the Dragon, was not to be missed. 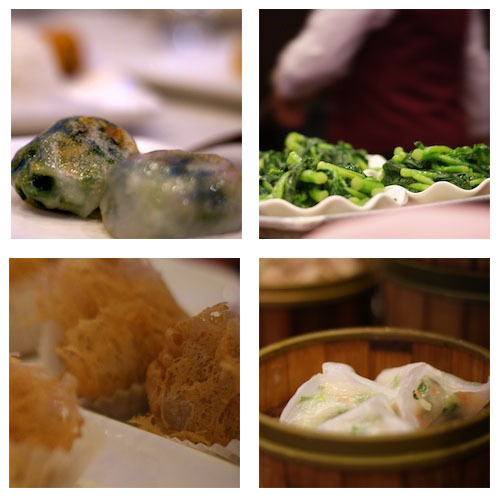 In an attempt to avoid the 40,000 other people who had the same idea, we met on the early side at the Hong Kong style Dim Sum restaurant Jing Fong. The place was gigantic (with 120 tables) and festive – with drummers and dragons winding their way through the tables while diners put money and red envelopes into their mouths. Our outing was organized by the same friends who taught us how to make dumplings for the Year of the Rabbit, and all I can say is that it helps to go with someone who knows what they are doing. They did all the ordering and soon our table was crowded with sticky rice, steamed buns and dumplings of all kinds. I just ate what was in front of me and I’m pretty sure it included all of the foods I had spent the last three weeks avoiding, but I subscribe to the when in Rome philosophy of dining out. 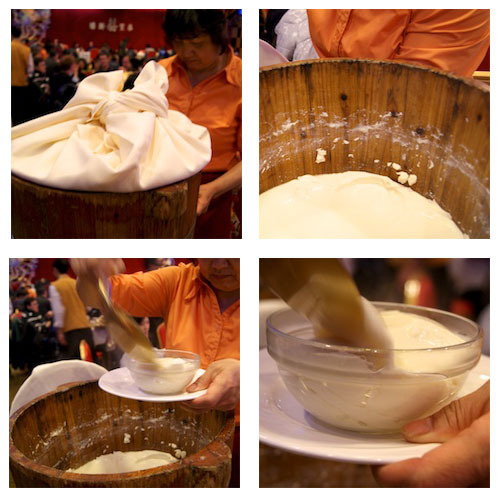 My favorite by far was the barrel of house made tofu with sweet ginger. I have a tofu maker, but haven’t had the motivation to try it, but now I’m inspired by this recipe. After dim sum, we ventured out to see the parade hoping to meet up with friends who were just across the street, but it was too crowded to find them. We just went with the flow of people while the kids sprayed silly string and launched paper rockets full of confetti. Total chaos and one of my favorite events of the year. 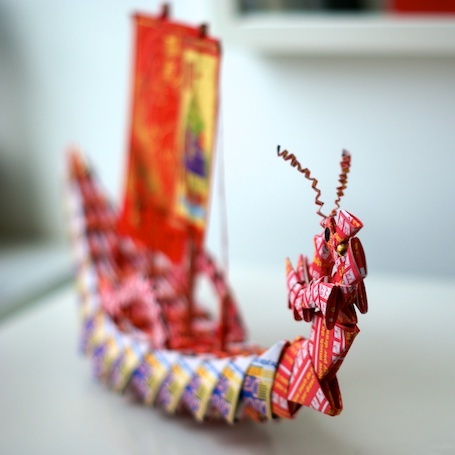 Happy New Year of the Dragon. 龙年快乐! This entry was posted on February 6, 2012, 5:45 pm and is filed under inspiration, kids. You can follow any responses to this entry through RSS 2.0. You can leave a response, or trackback from your own site. I love how you get the smudgy-focus-thing on all your pictures. You probably don’t have a point-and-shoot. I must read about your gluten-free venture. This is the Water Dragon year, I think it’s all about drinking more water this year. My kids (and me, why not) are big Kung Fu Panda fans and they have been asking for dumplings and I for “Inner peace”. I wonder what I will be serving first. I didn’t know about the Water Dragon – fascinating! It’s so dry right now we can use a water dragon around here. As for the camera- I have a Sony A330 DSLR. It was the least expensive model and I mostly shoot on auto (although I am trying to learn more). I love the camera and am usually surprised at how the images come out (not always pleasantly). Happy New Year to you, too!